UW-Madison has a tradition of interdisciplinary scholarship, with all PhD students completing a coursework minor as part of their studies. 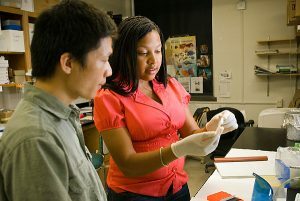 To provide outstanding opportunities for interdisciplinary training at the interface of physical and biological sciences, UW-Madison is formulating a doctoral minor in Quantitative Biology. The QBio minor is compatible with PhD programs in the biological sciences (e.g. Biochemistry, Cellular and Molecular Biology, Genetics) and physical sciences (e.g. Biomedical Engineering, Chemical Engineering, Computer Science, Math, Statistics). Students will complete the base curriculum requirements of their chosen PhD program. In addition, students complete elective coursework based on their background and specific research interests as well as a core ‘Methods and Logic in Quantitative Biology’ course to foster a tight-knit student community. A major benefit of QBio is that students attain the foundational knowledge of their home PhD program while fostering educational experiences at the interface of computer science, statistics, engineering, and biology. Find out more about the QBio minor here. PhD students interested primarily in bioinformatics and computer science may be interested in the planned PhD program in Biomedical Data Science (BDS), slated for Fall 2018. This program is aimed at students with strong skills in computer science and biostatistics who are primarily interested in computational analysis. The PhD program in Statistics offers two tracks for their students, in Biostatistics and in Biometry. The Statistics PhD program and associated tracks are most applicable for students with a strong statistical background and interest in gaining deep expertise in statistics. The QBio doctoral minor is available to a broad range of graduate students, independent of their chosen PhD program. QBio will be of interest to students working at the interface of physical and biological sciences.